Save your favorite videos into the digital age: For backup it will be high time. After all, VHS cassettes lose quality after 15 years! So do not go to work! Simply connect this smart video grabber to a video recorder or camera, you can save the treasures on your hard disk. You will be amazed how easy it is! Later on, you can burn your movies by clicking DVD. Also you can save records, tapes and the favorite cassettes of your youth via stereo audio connection to your hard drive! Transfer/Capture Video and Audio from Analog Video Source (VHS/VCR/Hi8/DVD/TV BOX) to Your Windows (XP / Vista / 7/8 32bit&64bit ). 4 Function: Composite to USB , SCART to USB , Composite to SCART , SCART to Composite. 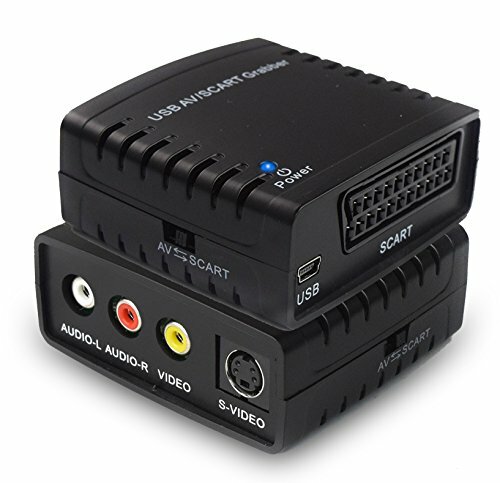 Captures Video in the Universal H.264 Digital Format - Supports NTSC, SECAM, PAL and PAL/60 video capture that easily share captured videos on social media. Create Polished Videos with Professional-grade Tools for Reducing Video Noise, Stabilizing Shaky Video, Color Correction, Transition Effects, and more. Split Videos to Span Across Multiple DVDs for Sharing or Storage. USB 2.0 PnP interface, included software, you can edit, and save videos in digital format.